I didn’t think it was possible, but I’m pretty sure our baby enjoys going for walks even more than our dogs. Well, at least more frequently! Since the little one arrived back in March we have been going for up to 3 walks per day. It is a great way to keep a fussy baby calm, a tired baby awake, and a curious baby, eager and alert. Well, as you can imagine, each time we head out the door we have a couple of pups who would just love to join us. 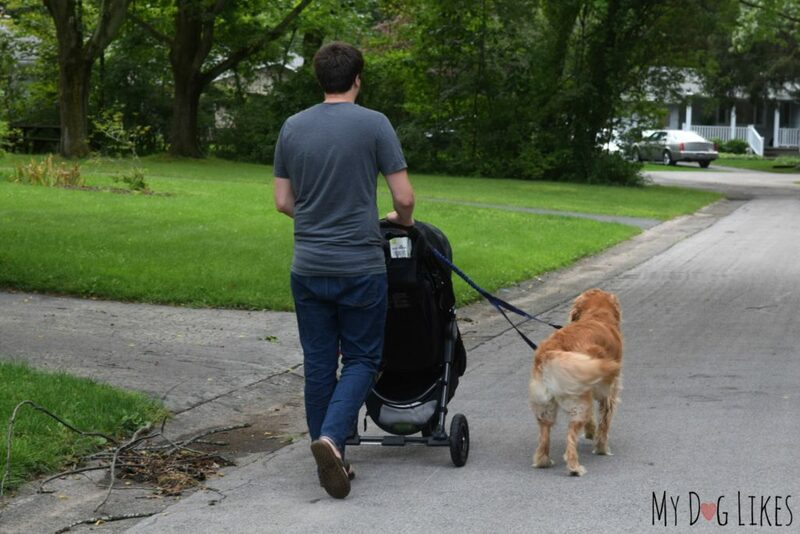 In this installment of our dogs and babies training series, we are going to be showing you something that has been key to our sanity over the past few months: How to get your dog used to walking next to a stroller! 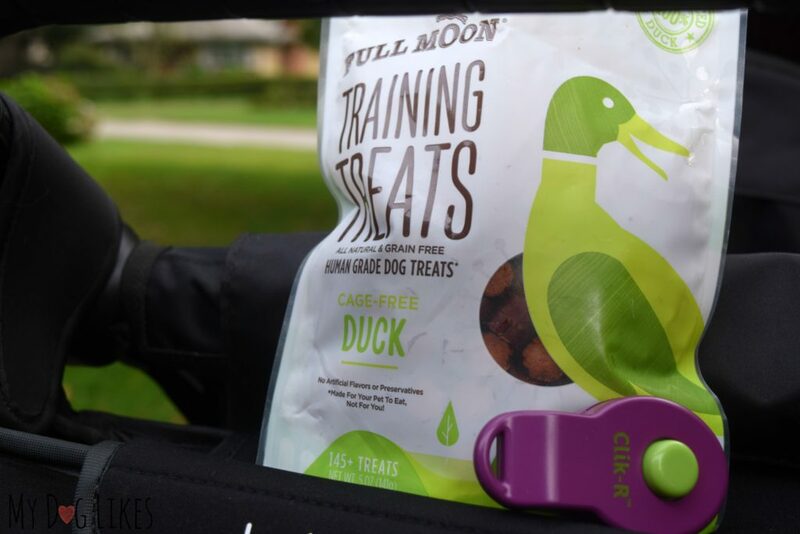 This post is sponsored by Full Moon, and we are going to be utilizing their new training treats to help guide Harley and Charlie every step of the way. 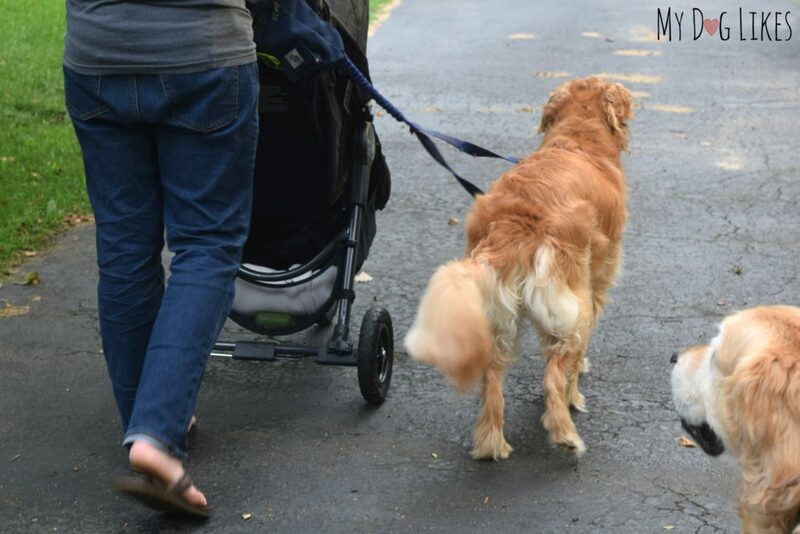 Training your dog to walk alongside the stroller is important for the safety of all of your children, both human and furry. 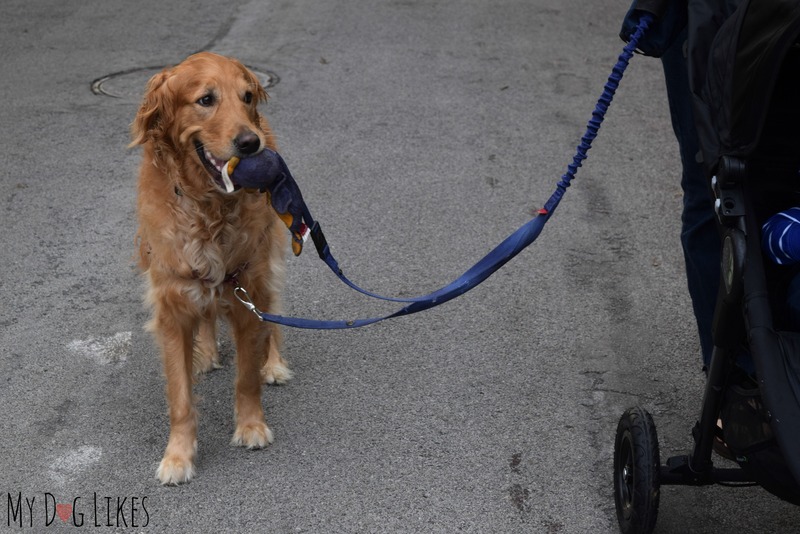 Even if your dog has mastered loose leash walking, when a stroller gets added to the mix, it changes everything. Small indiscretions like darting after a squirrel or crossing in front of you could mean trouble for you, the baby, or the dog. Additionally, when behind a stroller you give and get different feedback to your dog. For example, when we change direction or make a turn, we typically navigate this with light tugs on the leash and a verbal command. When pushing a stroller, your hands are holding the leash and the stroller handle at the same time, so directional changes can be more difficult. You want to make sure that they are used to these new scenarios before adding your baby to the mix – so keep reading for step by step training instructions! Lots of Training Treats – Positive reinforcement is the key to training success! 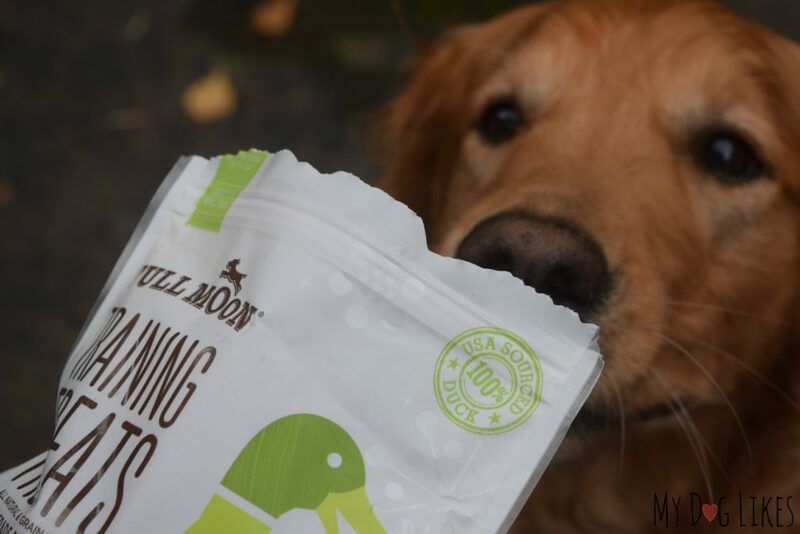 High value (and low calorie) treats like these ones from Full Moon are just the thing to reward proper behavior and keep your dog interested in training! Clicker – This nifty little training device fits in one hand and makes a short clicking sound with the press of a button. 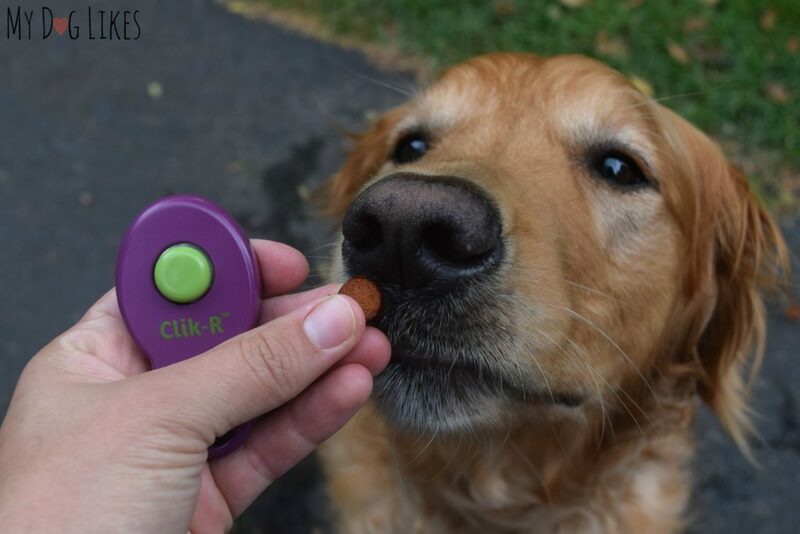 If you aren’t familiar with clicker training, here is a great place to start. We have several different clickers and they all work about the same – though this one has the most 5 star reviews on Amazon. Leash – You may want to use a longer leash than you are accustomed to since your hands will be on the handle of the stroller and higher than normal. Stroller – Obviously! In case you are looking for a recommendation we are in love with our Citi Mini! This thing can travel over anything which is especially great for dog owners who may be walking on roads, grass, dirt, sand or more. Plus it folds in half and is super lightweight. 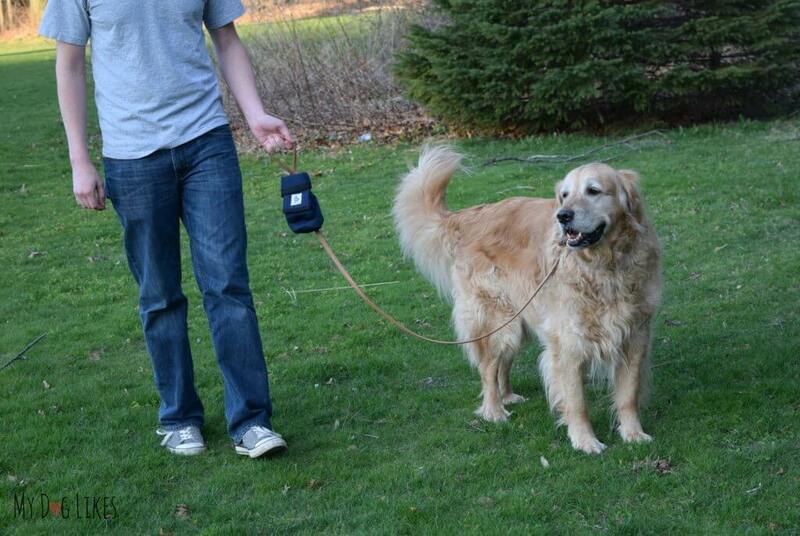 We like to begin each and every training session by re-introducing our dogs to the clicker. This is as simple as holding it out and letting them sniff it, as well as making it click and giving your dog a treat. This should jog their memory that the clicker brings with it fun times – plus lots and lots of treats! If your dog is a big puller, you will want to get their behavior under control before introducing a stroller and your baby. Thankfully, there are lots of ways to get your dog prepped in no time. One of the most common issues is finding the type of harness which they best respond to. Make sure to check out this article on our favorite tools for loose leash walking for some harness recommendations and other tips! Once you feel that they have their walking under control, it’s time to introduce them to the stroller. You will want to leave it parked with the brakes on and bring your dog to it, not the other way around. This is because dogs can be skittish around new objects – especially ones that move. 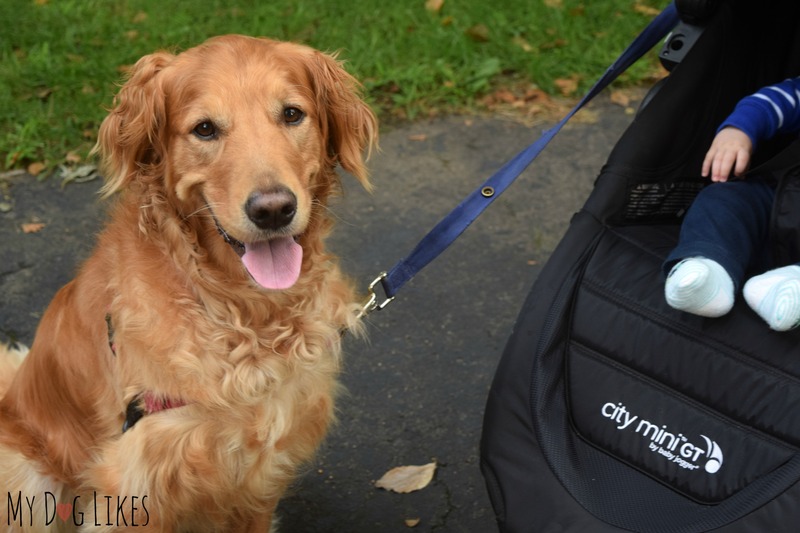 You want your dog to feel completely comfortable with the stroller, so take your time! 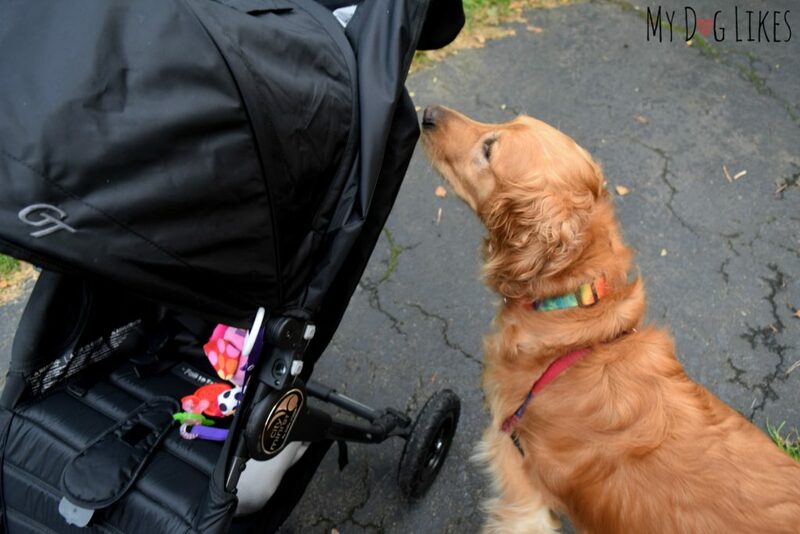 Walk your dog all the way around the stroller (treating as you go), and encourage them to take a closer look – sniffing and nudging as they please. 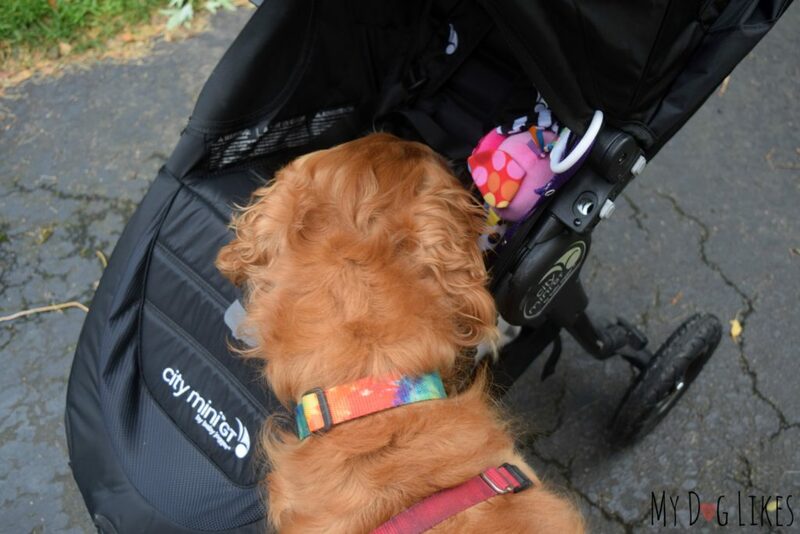 Sometimes it helps to hide a treat or two in the stroller so that they will be more interested and also gain positive feelings when they do end up finding it. Once you feel that they are comfortable with the stroller itself, you will want to show them the way that it moves. We practiced this in the driveway where there were no other distractions. First, simply rolled it gently back and forth to show them that it does move. Remember…click and treat, click and treat! Next, it’s time to teach your dog to walk next to a stroller. Find a distance away from you and the stroller that you both feel comfortable with, and stick to it. For us, having Charlie walk even with the stroller on the right hand side works best. Click and reward regularly as they stay in your preferred location. Make sure to practice turning in both directions in addition to forward movement. You want your dog to learn to watch the stroller and adjust their path accordingly. Now that your dog seems to understand how the stroller moves, and where they should be in relation to it, take them for a dry run. You want to make sure that everything has sunk in before introducing your baby! Head out on 1-2 typical walks (more if necessary) so that they begin to see the stroller as just a part of the experience. Step 6: Go for a walk with the baby! Now it’s finally time to put their new skill to the test! If you have multiple dogs, like us, start with just one dog at a time. While your dog is most likely used to the sounds and movements of your baby, but they may react differently in a new environment. Make sure to click and treat frequently on your first walk, so that your dog is having a positive experience all around. Continue rewarding them on future walks – though you can do so less frequently. You may find it helpful to just keep a clicker and bag of treats in your stroller so that you can reinforce their good behavior regularly. Now that your dog is comfortable walking with your baby, you can look forward to years of great adventures together! Any questions or tips? Please leave a comment below! If you would like to pick up some of our preferred training treats, click the links below! Dognition Review – Harley and Charlie Take the Test! the boys look so cute with the baby. Thanks Sandy! The dogs are already super protective of him and he absolutely adores them – laughing every time he sees them! Great way to train for a CGC test or Therapy Dog test too as they often use things like strollers and walkers to see if dogs are afraid. 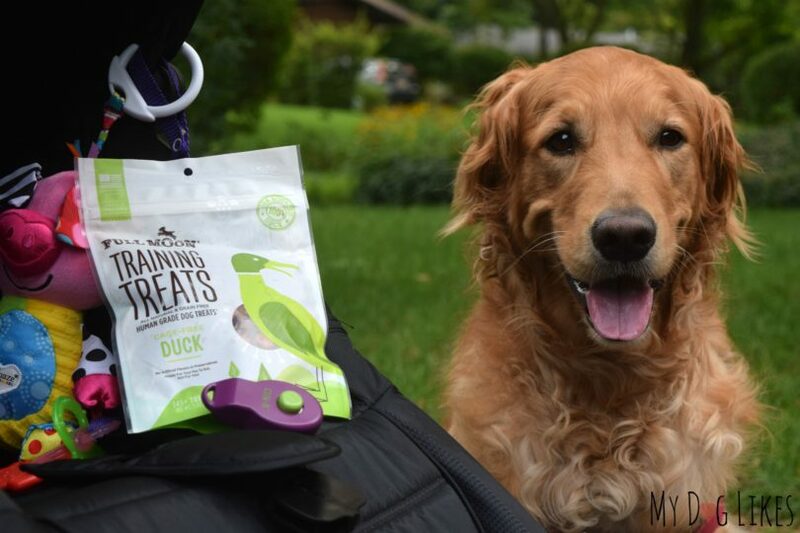 Sign up for the MyDogLikes newsletter and never miss a giveaway! Don't miss a bark! Stay up to date on all of the latest in the dog world!